Anna Ahbez (née Annette Jacobson) was, to her songwriter husband, a lover, a mother to his only child, and a fellow nature enthusiast. From 1946-68, Eden Ahbez commemorated Anna in more than a dozen songs, most of them still unreleased. 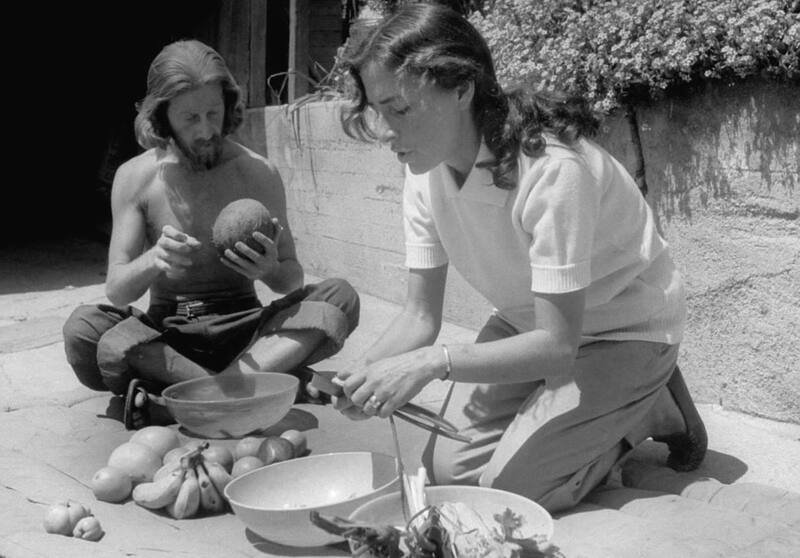 Eden and Anna Ahbez preparing an outdoors meal during the late 1940s. But who was this mysterious woman that stood side-by-side with her nature boy husband at a time when the alt-lifestyle was both rare and radical? First of all, Prady sets his memoir in and around 1947, the time when Eden Ahbez was pitching “Nature Boy” to Nat King Cole. The author guesses that Anna was then in her late twenties or early thirties. Actually, she was 28 years old according to a 1930 federal census record, which has her birthdate “abt 1919,” in Bay de Noc, Delta, Michigan. 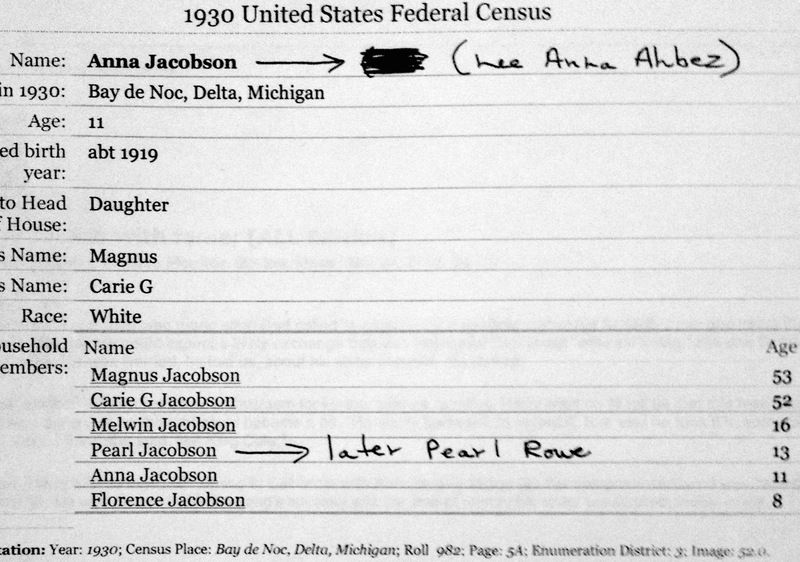 1930 U.S. census record for Anna Ahbez’s birth family in Michigan. Subsequently, Eden was 39 years old in 1947. Prady makes the mistake of stating that Eden’s birth name was Alexander Aberle, which is half correct—he was born George Alexander Aberle in Brooklyn, NY, April 15, 1908. Later in the article, Prady recounts the legend of how Anna met Eden. 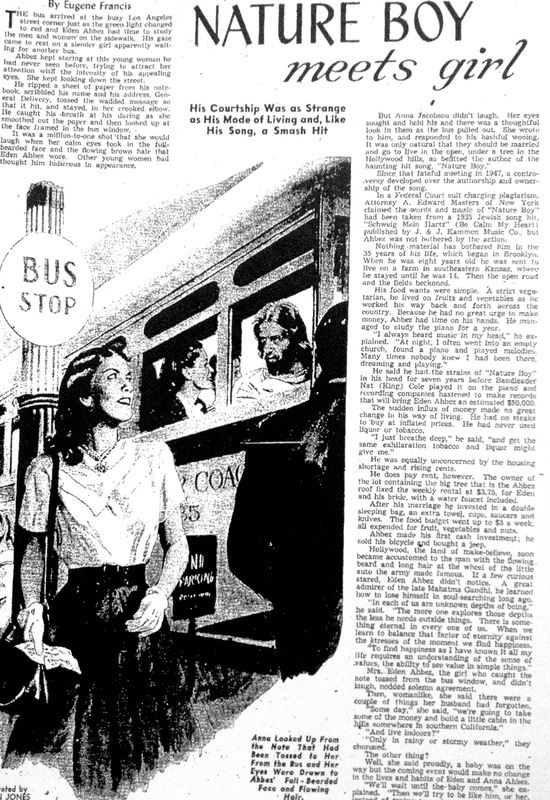 It is a tale the media too picked up on in 1948, as this romanticized clipping below reveals. The legend of Eden and Anna. By fall 1948, “Nature Boy” had finished its long run on the Billboard and Cash Box charts, where it was #1 for seven straight weeks and ran steadily in the Top 40 for most of the spring and summer. By October 17, 1948, Anna had given birth to a baby boy; the couple named him Tatha Om Ahbez—though he’d go by “Zoma” for most of his life. By then, the Ahbezes were living in Tujunga Canyon, a northeast suburb of Los Angeles, where they took their meals outdoors… on a tablecloth on the same ground where the family slept… in a friend’s backyard. 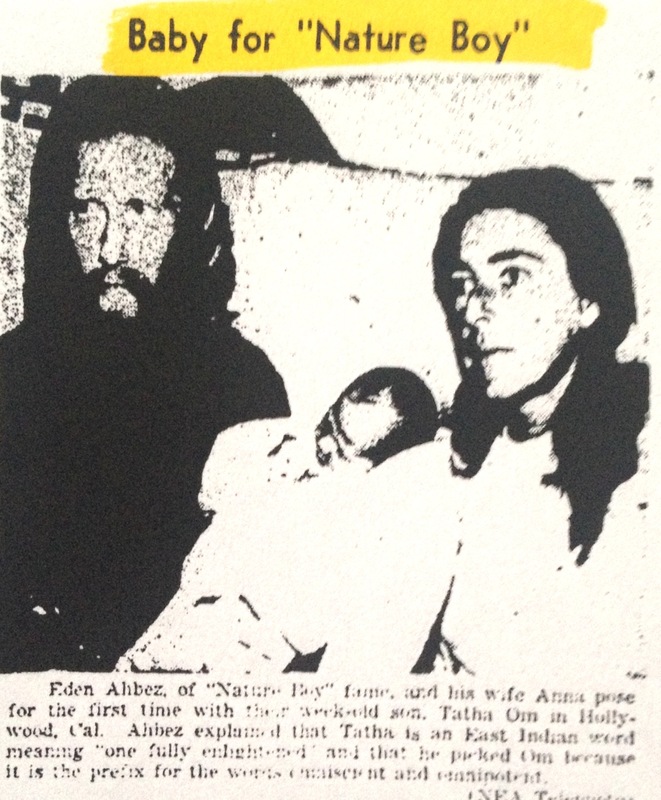 News clipping on the birth of Anna and Eden’s only child: Tatha Om Ahbez (aka Zoma). Prady’s recounting of the Jacobson family’s worry back in the old Michigan hearth paints an overall trustworthy picture of just how off-kilter Anna’s and Eden’s lifestyle would have seemed to conventional American eyes in the postwar era. Even still, the Ahbez clan continued to bounce around Southern California for most of the 1950s, living in a number of outdoor situations—from Silver Lake, to Koreatown (in Hollywood), to Whittier, even Venice Beach—where they raised young Zoma with the same alternative values they’d been living out for more than a decade now. But in 1962, tragedy struck. Anna contracted leukemia and died on August 9, 1963. She was just 44. According to a number of Ahbez’s friends, it was a loss he never fully recovered from, though he continued to commemorate their partnership in songs up until his very last days in the mid-1990s. We at the Eden’s Island Blog are happy to’ve discovered this little piece of info about the mysterious partner of Eden Ahbez. Hopefully a clearer picture of Anna will continue to emerge as time goes by. 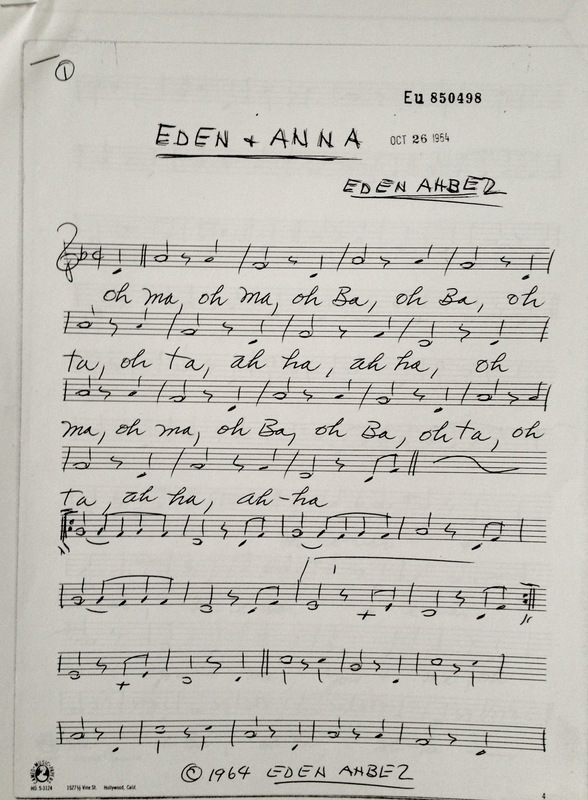 A page from Eden Ahbez’s five-part suite, “The Song of Eden and Anna,” written and copyrighted after Anna passed away in April 1963. Good work, Brian! Additionally, I am pleased that you introduced your readers to “Tatha Om” as Zoma’s birth name, because it was carefully selected for its mystical and Eastern philosophical implications. The child’s naming reflects the deep beliefs of his parents.